Today I gave my exam and scored 80%, I thank you all for the contributions in this website, this was real help and turning point for me, so many thanks and cheers to you all. I decided to give the exam in last month only and as I have good experience of working on different programming languages and recently started working on Java so it was hard for me to decide on whether to go for certification or not and now I really proud of my decision. 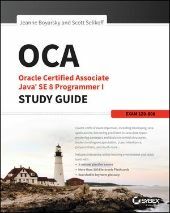 Initially, I took the exam very lightly as I read lot of books during initial years of my job and eagerly waiting to finish it as I was interested to go for the next level. I must say, if I had gave exam at that moment, it would have been hard for me to even pass the exam. The overall exam was not so easy for me and I really did hard work in past couple of months, it needs lot of practice, concentration to give this exam and now, I am happy. Keep calm and do lot of coding practice, there were so many questions on coding, loops, if-else, output, some of the questions were really tricky, some were looking really big, however, answers were easy, so you should go through the ques and answers carefully. I followed Jeanne and Scott's advise, it helped me a looot!!! (read the "Appendix B: Study Tips"), that's the key. You might get longer and time taking questions in the start, and you might get the easy ones in the last, so first go through the whole question paper till the end, before investing time in the long ques. You might get nervous (I got initially :-), as I wanted to finish each and every question after trying them properly, but then recalled Author's advise ) and once you get nervous, you may loose focus on other simpler question, so its better to get back to time taking question a little later. One last point - don't take anything lightly, do your homework, as in the end, what matters is knowledge and its implementation :-)). Thanks again to you all and All the best! Congrats Mamta! Feel free to edit the Wall of Fame wiki page to add yourself. Thanks Jeanne! I added myself.